Rate this project Stefan Lippers-Hollmann has announced the release of aptosid 2013-01, a modern desktop Linux distribution with a choice of KDE or Xfce desktops and the latest Linux kernel, based on Debian's "unstable" branch: "We have the pleasure to announce the immediate availability of the aptosid 2013-01 "Hesperides" release. New features are in particular kernel 3.9 and numerous integration and stabilisation fixes. Special focus has been cast upon improving system compatibility with various UEFI systems and the Ivy-Bridge architecture; basic Haswell support should now be complete. Kernel 3.9 doesn't only improve and stabilise hardware support for newer devices, it also improves power-saving approaches for libata targets." Read the detailed release notes for more information, system requirements and upgrade instructions. Download (SHA256): aptosid-2013-01-kde-full-i386-amd64.iso (1,982MB), aptosid-2013-01-kde-lite-amd64.iso (623MB), aptosid-2013-01-xfce-amd64.iso (511MB). Stefan Lippers-Hollmann has announced the release of aptosid 2012.1, a new version of the project's desktop Linux distribution based on Debian's unstable branch. From the release notes: "New features in aptosid 2012-01 are Linux kernel 3.6 and numerous integration and stabilisation fixes. Special focus has been cast upon improving system compatibility with new hardware platforms like AMD Bulldozer or Intel Ivy-Bridge and reworking the live system environment. Kernel 3.6 doesn't only improve and stabilise hardware support for newer devices, it also adapts ASPM heuristics for better power-saving and improved battery runtimes. Another topic has been the kernel's entropy gathering framework, both improving its performance and quality for systems providing little entropy by themselves." Download (SHA256): aptosid-2012-01-kde-full-i386-amd64.iso" (2,054MB), aptosid-2012-01-xfce-i386.iso (509MB), aptosid-2012-01-xfce-amd64.iso (515MB). Happy New Year! The first announcement of 2012 (referencing the Coordinated Universal Time or UCT) goes to aptosid and the project's brand-new release, version 2011-03: "We now have the pleasure to announce the immediate availability of the final aptosid 2011-03 'Ponos' release. New features are in particular kernel 3.1 and numerous integration and stabilisation fixes. Special focus has been cast upon improving the system compatibility with new hardware platforms and various corner cases. Kernel 3.1 doesn't only improve and stabilise hardware support for newer devices, it also improves latency and general system performance, particularly vastly improved I/O scheduling for LVM and MDADM on SSDs. Among the new features are initial Xen dom0 and PCI passthrough support as well as nested virtualization for KVM on Intel and AMD CPUs." See the detailed release notes for more information. 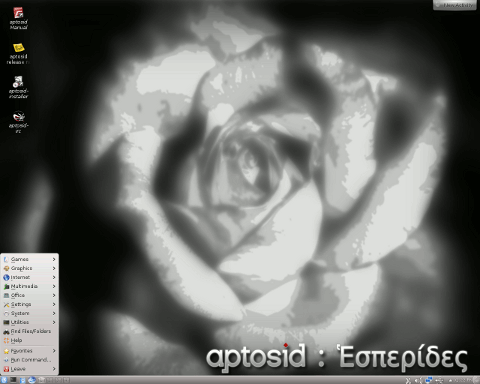 Download (SHA256): aptosid-2011-03-kde-i386-amd64.iso (961MB), aptosid-2011-03-xfce-i386.iso (486MB), aptosid-2011-03-xfce-amd64.iso (491MB). Stefan Lippers-Hollmann has announced the release of aptosid 2011-02, a desktop distribution based on Debian's unstable branch and featuring the latest KDE and Xfce desktops: "Now that kernel 2.6.39 and KDE 4.6 have entered the archive and stabilised in sid after the 'Squeeze' release, we have the pleasure to announce the immediate availability of the final aptosid 2011-02 'Imera' release. New features in aptosid 2011-02 are numerous integration and stabilisation fixes. Kernel 2.6.39 doesn't only improve and stabilise hardware support for newer devices, it also improves latency and general system performance. Starting with KDE 4.6 and Xfce 4.8, HAL has now become obsolete and got replaced by event-driven udev-based alternative which allows to run common desktop setups without the HAL daemon. Read the detailed release notes for more information. Download (SHA256): aptosid-2011-02-kde-full-i386-amd64.iso (1,960MB), aptosid-2011-02-xfce-i386.iso (468MB), aptosid-2011-02-xfce-amd64.iso (473MB). Stefan Lippers-Hollmann has announced the release of aptosid 2011-01, a desktop distribution (with KDE or Xfce) based on Debian's unstable branch: "Now that kernel 2.6.37 has entered the archive and Debian 6.0 'Squeeze' is in the process of being released, we have the pleasure to announce the immediate availability of the final aptosid 2011-01 'Geras'. New features are in particular kernel 2.6.37 and numerous integration and stabilization fixes after completing the transition to aptosid. Kernel 2.6.37 doesn't only improve and stabilise hardware support for newer devices, it also improves ext4 performance (lazy inode table initialization), implements the USB Attached SCSI Protocol (UASP) for USB 3.0 storage and adds support for Intel's new Sandy Bridge graphics cards." The detailed release notes provide comprehensive information about the release. Download: aptosid-2011-01-kde-full-i386-amd64.iso (1,878MB, SHA256), aptosid-2011-01-xfce-i386.iso (430MB, SHA256), aptosid-2011-01-xfce-amd64.iso (435MB, SHA256). Stefan Lippers-Hollmann has announced the release of aptosid 2010-03, a Linux distribution based on Debian's unstable branch, but using a newer Linux kernel with improved hardware support: "Now that kernel 2.6.36.2 has entered the archive with many KMS-related bug fixes, we have the pleasure to announce the immediate availability of the final aptosid 2010-03 'Apate' release. New features are in particular kernel 2.6.36.2 and numerous integration and stabilization fixes after the rename. Kernel 2.6.36.2 doesn't only improve and stabilise hardware support for newer devices, it also features improved KMS support for ATI Radeon and Intel graphics cards and performance improvements for Intel Westmere graphics chipsets. WLAN support has been consolidated, with rt2x00 now supporting Ralink rt28x0/ rt30xx/ rt35xx officially." Read the detailed release notes for more information. Download (SHA256): aptosid-2010-03-kde-full-i386-amd64.iso (2,030MB), aptosid-2010-03-xfce-i386.iso (490MB), aptosid-2010-03-xfce-amd64.iso (496MB). Version 2010-02 of aptosid is the first official release of what was previously known as sidux, a cutting-edge, desktop Linux distribution based on Debian's unstable branch: "Now that aptosid has opened its gates, we have the pleasure to announce the immediate availability of the aptosid 2010-02 'Keres' release. Aptosid is created by the same team of volunteers developing software under the Debian Free Software guidelines and continues what has been started in November 2006 under the name 'sidux'. New features in aptosid 2010-02 are kernel 2.6.35.4 and KDE 4.4.5. Kernel 2.6.35 doesn't only improve and stabilise hardware support for newer devices, it also features improved power-saving support for ATI Radeon and Intel graphics cards and improved hardware video acceleration." Read the release notes for a detailed list of changes and new features. Download (SHA256): aptosid-2010-02-kde-i386-amd64.iso (2,065MB), aptosid-2010-02-xfce-i386.iso (480MB), aptosid-2010-02-xfce-amd64.iso (486MB). sidux 2010-01, a new version of the desktop distribution with KDE or Xfce based on Debian's unstable branch, has been released: "Now that KDE 4.4.4 and kernel 2.6.34 have entered the archive, we have the pleasure to announce the immediate availability of the final sidux 2010-01 'Hypnos' release. While waiting for the availability of KDE 4.4.x, 'Hypnos' development concentrated on overhauling the early boot sequence for live and installed systems with regards to concurrent dependency-based booting and the integration of kernel 2.6.34. sidux now uses CONCURRENCY=makefile and continues to embrace GRUB 2 on the installed system, with isolinux and an improved gfxboot theme on the live system. KDE-based ISO images can now make use of Partition Manager instead of GParted. As usual, a large number of individual functionality enhancements and bug fixes have been applied to the full package line-up." Read the detailed release notes for further information. Download (SHA256): sidux-2010-01-kde-i386-amd64.iso (2,179MB), sidux-2010-01-xfce-i386.iso (512MB), sidux-2010-01-xfce-amd64.iso (519MB). Stefan Lippers-Hollmann has announced the availability of the first preview release of sidux 2010-01, a desktop Linux distribution and live CD based on Debian's unstable branch: "Now that KDE 4.4.3 and Linux kernel 2.6.34 have entered the archive, we have the pleasure to announce the immediate availability of the first preview for sidux 2010-01 'Hypnos'. While waiting for the availability of KDE 4.4.x, 'Hypnos' development concentrated on overhauling the early boot sequence for live and installed systems with regards to concurrent dependency-based booting and the integration of kernel 2.6.34. sidux now uses CONCURRENCY=makefile and continues to embrace GRUB 2 on the installed system, with isolinux and an improved gfxboot theme on the live system. KDE-based ISO images can now make use of Partition Manager instead of GParted." Read the detailed release notes for more information. Download (SHA256): sidux-2010-01-pre1-kde-lite-i386.iso (618MB), sidux-2010-01-pre1-kde-lite-amd64.iso (624MB), sidux-2010-01-pre1-xfce-lite-i386-amd64.iso (818MB).